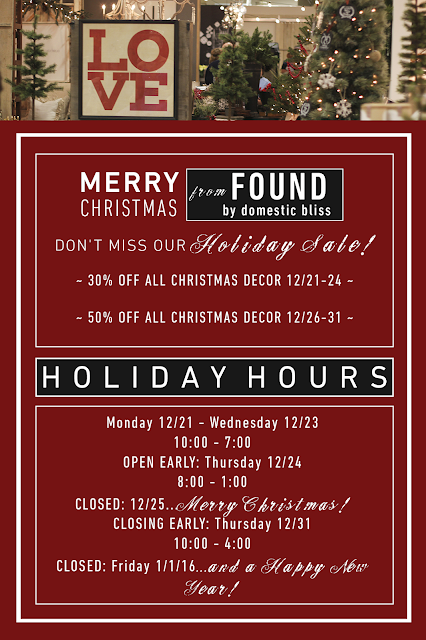 FOUND by domestic bliss: Happy Holidays from FbDB! It's been an incredible year for all of us, and we want to wish all of you the happiest holiday season, as well. We hope you can drop by the store and finish out 2015 with us at FOUND by domestic bliss! Come celebrate with special holiday deals, early store hours on Christmas Eve for any last minute shopping needs, and an after Christmas sale lasting right up until New Year's Eve. May your days be merry & bright!